Self-help is a book written with the aim of guiding readers to solve personal, inspiring and motivating issues that change the lives of millions of people around the world. Self-help Book - also known as "Self-help Book", is understood as a meaningful guide to help readers improve themselves or solve personal problems through interesting things written in book. It may be something that cultivates the mind, cultivates - the form of "Learning To Be Human", or the famous "Dac Nhan Tam". Today, every year, there are hundreds of millions of Self-help books born with the promise of making us better: being a better parent, being a more devoted partner, a nest function more effectively; more perfect in all aspects ... With such a huge amount, the book Sefl-help cannot avoid the situation of yellow brass. Which book really gives value to readers, which is just unrealistic clichés. Throughout the work is a profound lesson about business transmitted through symbolic images such as mice, cheese pieces. 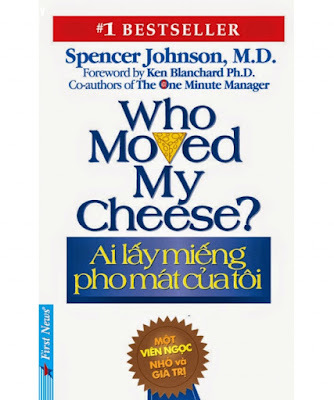 Whoever took my cheese continuously reached the top of the best-selling books for 5 consecutive years with 26 million copies sold worldwide. Until now, the main character in the story, rat Sniff, Scurry and Hem, Haw remained the same transmission value as 20 years ago. Anthropology is probably the most impressive set of self-help books. Compassion provides valuable advice in all aspects of life from making friends to becoming more successful in your career. Help people learn to live, ignore criticisms, always remember the names of others and practice listening more. Carnegie has never confirmed that he has created anything. When asked about his philosophy, he replied only, "The idea of ​​this book is not mine. I borrowed it from Socrates. I took it from Chesterfield. I stole it from Jesus." According to the 2011 Times Times survey, this book ranked 19th in the list of the most influential works of all time. After serving the army during World War II, Og Mandino fell into heavy alcoholism as well as a bad business. When his wife and children left, he once intended to commit suicide, but he watched some self-help books before deciding to end his life. He himself said, what he read then changed his life completely, and it also helped him quit alcoholism. He later became a very popular author and he also created the Greatest Salesman in the world in 1968. So far, the World's Greatest Seller has been translated into 25 languages ​​and sold over 50 million copies, becoming one of the world's best-selling books. Stephen R. Covey was a teacher at Brigham Young University in 1989. According to an article on Covey's website, he said the success of the book stems from "the simple reason is that it ignores everything. common points about human notions such as justice, kindness, honesty or self-esteem of people ". In this book, Covey delves into the importance of personality and morality. He realized that successes in life have a direct link to the desire to re-arrange life according to certain key universal principles. Up to now, more than 25 million titles have been released, even the re-make film of the same name has been aired. William H. Danforth was the founder of Nestle Purina (before merging with Nestle in 2001 only Purina grinders) in 1894. He thought that life was like a game. Danforth stressed that four important elements (or "squares") include: intellectual, physical, social and religious; always have to be balanced to be successful in life. All his thoughts and ideas are summarized in the book I Challenge you published more than 70 years ago. He encouraged all readers, regardless of age, to seize opportunities and improve their own potentials. M. Scott Peck, psychiatrist, known for his masterpiece in 1978 - The road is few. In this book, Peck talked about how to improve everyone's life, giving lots of ideas about love and relationships. Peck said that a common mistake of all people is that they always recognize the love relationship is only a means to "achieve" and not find ways to understand them to "give away". The love he wants to convey is to nurture and understand others. Peck also emphasized the importance of self-discipline and wants to achieve success, we must solve problems in our lives, as well as find ways to overcome the tough challenges of life. He wrote in his work that, "Only through problems arise, can we grow both intellectually and spiritually". The thought of "The Law of Attraction" is very prominent in American culture since at least the early 1900s when it became known to the public in the flow of the New Thought movement. The dominant thought of "Attractive Law" is "What you want, want you". Accordingly, positive thoughts will appeal to positive results; negative thoughts only bring unwanted results. The attractive Law of Losier published in 2004 received much praise from readers for giving clear, thorough explanations of this principle. The book also offers many guides and tools to help readers know how to apply these ideas into everyday life. The classic book of this self-help genre was first published in 1937 - the culmination of the recession - and has remained one of the best-selling books of all time. To write this book, Napoleon Hill studied the lives and careers of 40 millionaires, to discover their secrets to success. Since then, he draws on their decades of experience to introduce readers. Opening the research book on heterosexual relationships, the author immediately confirmed that women and men are completely different in nature. Besides, understanding the characteristics of the rest of the gender is the key to better relationships. Almost all of us understand that women and men are always different: Why do women like to share their feelings and men who are so passionate about sports? The work sold 50 million copies and became the most non-fiction novel in the 1990s according to CNN. More interestingly, the title of the book has become an inspiration for countless works, movies or other videos. Famous writer and speaker Anthony "Tony" Robbins is also a big monument in self-help books since the 1990s. The book Awakening the extraordinary person in you published in 1992 interpreted the strategy that he called "concentration of strength", or a way to harness human ability to help them achieve their goals. Robbin has encouraged readers to give up their narrow thinking to enhance their standards. He stressed that each of us should be more confident in ourselves to be able to do more or what we think is impossible. The book offers useful advice on job search and employment. Although it has been reprinted many times, added elements to suit the digital age, but what color is the core value of your Umbrella Tree? remains the same and inspires countless readers. Up to now, more than 10 million copies have been dispersed and this number is expected to increase. Franklin's life stories have never stopped the excitement and interest of readers. To date, more than three centuries have passed when the Benjamin Franklin Autobiography was born, it has always been favored by many readers. he came when he became one of the most famous politicians and writers in the world. Franklin's original book, "Recollection", is not yet complete. It was not until he died in 1790 that it was first published in Paris by a French translator. This work is also known as the first book written by an American, which has attracted a lot of European readers.